EUR/CHF dives as the single currency dented across the borad on dismal German/Euro-zone manufacturing PMIs. German manufacturing PMI showed that factory activity slipped deeper into contraction territory in March. Composite Euro-zone manufacturing PMI also fell to a 71-month low level of 47.6. The latest disappointment from German/Euro-zone manufacturing PMI prints helped reignite global growth worries. Technicals are heavily bearish on the intrday charts. The pair is trading below 61.8% Fib retracement. Next major support lies at 88.6% Fib at 1.1212. 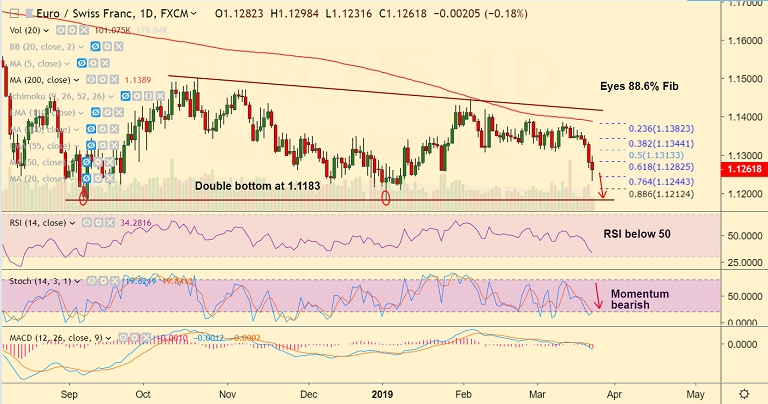 Break below eyes 'double bottom' at 1.1183. Call update: Our previous call (https://www.econotimes.com/FxWirePro-EUR-CHF-rejected-at-session-highs-break-below-11344-to-see-further-downside-1511726) has hit all targets.